Hello, I am going to tell you about the excellent cage provided for me by my pet human, called Helen. She has given me a metal wire cage with a large, plastic red base, about two feet long and one foot wide. Before me the cage belonged to a hamster called Wallace, but she called him Wally. I like to make a nest in the back right corner of my cage with toilet paper, paper-tissues, torn up cardboard and a soft bedding from the pet shop (not the cotton stuff). Making the nest is one of my favourite games. I spend a long time collecting torn-up tissues from around my cage and putting them in the correct corner, the human does not understand where they should be and drops bedding anywhere in the cage. Then I burrow into the bedding and make a hollow in the middle for me to sleep in. I pull the tissues at the edges over me so that I am completely covered. Next to my nest, along the back of the cage, is a large, solid, plastic, magic wheel. This is a lovely toy and when I am full of energy I can run and run all night on it. But I am a little confused because no matter how far I run, when I jump off the magic wheel I am always still in the cage. 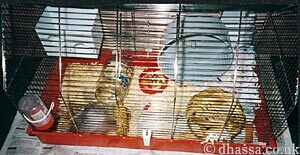 When I run for long distances from my cage in the bigger rooms of the humans, I need to turn around and run the other way to find my cage. That is why I think that the wheel is magical. To the left of the magic wheel is my food bowl. This is where a lot of my food is put by Helen every evening. When she has special bits of food, such as the delicious yoghurt drops, she gives them straight to me. I am very careful when I take food from her fingers to make sure that I do not hurt her. I sniff the food carefully to identify which bit is food and which is finger, then I take a very light hold of the bit which is food. Occasionally she only puts a finger in front of me, not food, but I can tell the difference. She tells me that I am very clever for being able to do this and I am proud of my skill. 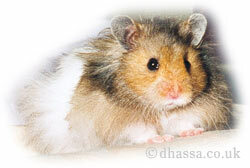 But I am a very calm hamster and I just ignore her when she becomes excited about my abilities. Sometimes I have another bowl that contains porridge-oats and milk. Instead of picking this up and eating it out of my hands, I have to lick it out of the bowl, but it tastes so lovely that I would eat it in any position. Left of the food bowls I have a glass jar for me to sit in and wash. Above this is an empty plastic house, with no lid, hooked on the bars near the top of the cage. There is a piece of cardboard at the front of the cage for me to sit on and wash. I also have a fairly large ball made with strips of bamboo or reeds (a material like this), that I can climb inside and use as a bed. But I have only slept in it once when I was too tired to make my nest at the end of the night. I like to climb on top of it and stand up to listen to humans. The humans think it is funny when I climb on the ball because I wobble about a lot. At the moment there is an egg-box lid at the front of the cage, this is much easier to stand on and listen to the humans. When I want to come out of my cage to play, I climb up the bars at the front and look at the part of the cage that opens, then I climb down and look for a human who can open it. For when I really want to come out, I learnt to hold the door with my front paws and hold the bar it hooks over with my teeth. Then I pull my weight up with my teeth and push at the door with my paws, then let it drop back. I do this several times, making a lot of noise, until my arms become tired and I fall down. 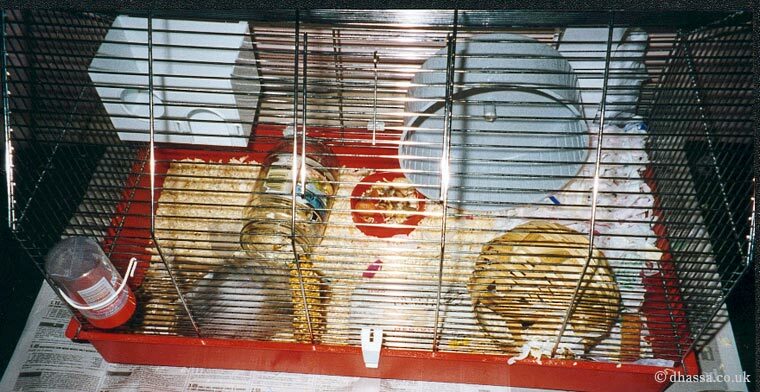 Here is a picture of my cage, you can click on it to see a bigger picture. I enjoyed telling you about it.